The Italian driver, pipped when in sight of the finish line, ended in second place. Very good level of competitiveness of CRG's chassis with Forè protagonist in the final race of WSK. In KFJ Dionisios and Kostantinos out of the Final due to incidents. In 60 Mini Noah Watt of Gamoto Racing the best of CRG/Hero drivers. Castelletto di Branduzzo (Pavia, Italy). The victory slipped off Davide Forè's hands for him to be fully satisfied at the end of a weekend always on top in the WSK Final Cup held in Castelletto di Branduzzo. The Italian driver on CRG-Tm belonging to team DTK just missed out on the win at one corner to the flag in the Final after a nice battle with Hajek to whom he stole P1 in the initial stages. The epilogue in the Final has been quite exciting but not happy at all for Davide Forè, as the Italian driver could not fend off Hajek's attack – when already in sight of the finish line – and obtained a second place right in the slipstream of the Czech driver. After getting just two thousands short of the pole position, Forè confirmed to be protagonist also in the qualifying heats of Castelletto where he obtained the second absolute place and then the second in the Prefinal. In the Final he has been leading the race on and off, exchanging his position with Hajek. During the final 7 laps Forè led the race until the final corner. He obtained anyway a truly deserved podium closing ahead of Mirko Torsellini. CRG colors are also present in the top ten of WSK Final Cup with the Austrian Marcel Mueller, who produced a good race ended in tenth place. The KZ2 Final held in Castelletto di Branduzzo has been a nice one, another race where CRG chassis has been under the spotlight in an international event closing the WSK season, a series where the Italian firm obtained a lot of satisfaction in this successful season with the titles obtained by Max Verstappen in Euro Series KZ1 and in WSK Master Series KZ2, on top of some rounds victories clinched by Felice Tiene in WSK Euro Series' round of Zuera in KF and by Davide Forè in Genk's KZ1. 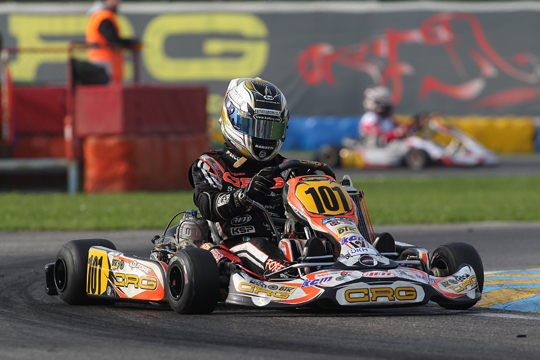 In KF Junior, CRG official colors were present for the first time on TM engines by Galiffa Kart. Marcu Dionisios and Kostantinos unfortunately did not manage to qualify for the Final due to some incidents they have been involved in during the Prefinal. Dionisios was quite disappointed as his eighteenth final place was just one position short of the qualification to the Final. Positive experience for the Greek driver Kostantinos instead, who came from 60 Mini for his debut in KFJ. Noah Watt, fourth, has been the best among the Gamoto Racing drivers on CRG/Hero competing in 60 Mini – the very tight category reserved to the youngest drivers – while Abdul Muizzuddin was seventh, Fetisov Bogdan ninth and Nazim Azman 13th. Moreover, DR Racing's Ivan Grigorev ended 18th and Leandro Anderruti of Lindi Rancing was 19th. In KFJ the Final was won by Robert Shwartzman (Tony Kart-Tm), in KF the victory was clinched by Callum Ilott (Zanardi-Parilla) and in 60 Mini by Giuseppe Fusco (Lenzo-Lke).